Welcome to the Stuck in a Good Book Giveaway Hop hosted by Stuck in Books & I Am A Reader! Today I'm featuring The Drafter (The Peri Reed Chronicles #1) by Kim Harrison because it's one I've recently started and it's by one of my favorite authors! I recently stuck in When a Scot ties the Knot by Tessa Dare. Following on twitter @InUraniborg. Nobody Is Ever Missing, by Catherine Lacey is what I've been stuck with recently. I've been stuck in Queen of Shadows recently. I've been stuck in Pieces of Perfect by Elizabeth Hayley. The Hashtag Series by Cambria Hebert and the Legends Saga by Stacey Rourke. Sooo good! I recently reread the Lux series by Jennifer L. Armentrout and WOW it is still so addicting, I love them. Thank you for the giveaway! Been SO into Throne of Glass and so excited book 4 is out this month. The Job by Janet Evanovich. I was stuck in The Aubrey Rules by Aven Ellis. It was FABULOUS! I'm currently stuck in Taking the Ice by Jennifer Comeaux. I'm stuck in Mr. Mercedes by Stephen King. I follow you on Twitter (@pippirose77). I'm totally stuck in the October Daye series by Seanan McGuire! Vicious by V. E. Schwab. A book I'm stuck in right now: Wicked Nights by Gena Showalter. I've been stuck on Batman Year by Year: A Visual History by Matthew K. Manning. There is so much useful, and fascinating, information in there. I'm usually "stuck" in lots of different children's books as I read to my grandson! I have been stuck in Mindy Kaling's latest book. I'm reading More Than One Night by Nicole Leiren. Following on twitter @jenluvsbooks. I've been stuck in Vicious by V.E. Schwab. I have been stuck with Mr. Mercedes. I've just finished the brigid kemmerer series elemental, and spark and secret made it to my 'happy book' shelf! Although since then i've read a few books that have fallen flat so i'm hoping to get some good reccomendations on this hop! Blackmoore by Julianne Donaldson! I love it. I was stuck in the Scorch Trials. I have been stuck in Rock Addiction by Nalini Singh. Lately, I've been reading "Dragonfly in Amber" from the Outlander series by Diana Gabaldon. The Diviners series by Libba Bray. I can't get enough. Cold burn of Magic by Jennifer Estep. The Martian by Andy Weir!!! I'm really looking forward to the movie :) thanks for sharing! I am stuck in Robyn Carr's A new hope. I'm re-reading C.C. Benison's Her Majesty Investigates series. The last book I was stuck in was The Name of the Wind by Patrick Rothfuss. Devoted in Death, the latest J.D. Robb. I recently got stuck in The Martian and couldn't put it down! I've been stuck in a new mystery, The Hanging Girl, by Jussi Adler Olson. I've been stuck in the book The Shores of Spain. I'm reading Stephen King's The Green Mile. So good! Love Nouveau by B.L. Berry. Me Before You by Jojo Moyes. Thanks for the giveaway! My boys and I have been listening to the Laura Ingalls Wilder books. My vision causes headaches these years. I'm following you on Twitter. My Twitter handle is @willms_m. I am currently reading Dragonbane (Dark Hunter series) by Sherrilyn Kenyon. 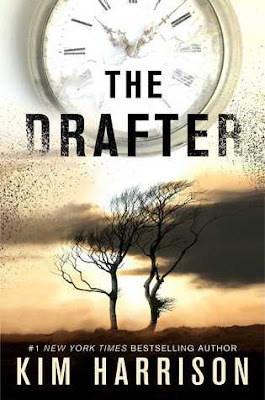 The Drafter is on my wishlist. Thanks for the great giveaway. I've been reading an ARC of The Sound of Silver, a to-die for historical fiction romance. Set in the 1500's during the Iconoclastic Fury. It's deep and amazing! Queen of Shadows by Sarah J Maas!! I'm stuck n...OUt Of Bounds by: Dawn Ryder! Happy Reading! Thanks! I just read A Court of Thorns and Roses and was completely stuck in it!! I'm currently reading Every Second with You by Lauren Blakely. Thanks for this chance! I'm stuck in The Sword of Truth series by Terry Goodkind. Very very awesome series! Currently reading Trust Me by Brenda Novak, but was completely stuck in Magic Shifts by Ilona Andrews lately! I got totally stuck in Grave Mercy by Robin LaFevers earlier this year. It's fantastic. I have been stuck in Cress the third book in the Lunar Chronicles. I've been stuck in the Throne of Glass series lately! :D I'm about to start Queen of Shadows. Cronin's Key 3 by NR Walker....love it! I was stuck with The Martian by Andy Weir. The last book I was stuck in was Blood Magick by Nora Roberts. I've been stuck now with "All the Bright Places " by Jennifer Niven. I am currently reading All The Light We Cannot See and it's beautiful, I feel like it'll be the next book on my stuck in list. Thank you. I'm stuck in The Specialty Coffee Book, a beautiful book full of the best coffee shops in Australia. I recently read Contaminated by Em Gardner and it was a really good YA book. Thanks. I was stuck in An Ember in the Ashes. Thanks for the giveaway! I've been stuck in Aflame by Penelope Douglas. I just started Enslaved by Evangeline Anderson. I've been stuck in A Court of Thorns and Roses by Sarah J. Maas. I am stuck on The Worst Hard Time: The Untold Story of Those Who Survived the Great American Dust Bowl by Timothy Egan. It is a great book. @versatileer follows @BookLiaison on Twitter.